Anritsu Company, the global leader who introduced the first handheld wireless network analyzer 20 years ago, ushers in a new era of field wireless testing with the introduction of Remote Spectrum Monitor, a platform of modular and scalable products that helps operators generate a greater return on their multi-billion dollar spectrum investments and maximizes network capacity to meet consumer demand. Designed without a display or keyboard, Remote Spectrum Monitor automates the method of conducting radio surveillance, interference detection, and government spectrum policy enforcement while bringing greater flexibilities and cost efficiencies to network management. Remote Spectrum Monitor features two spectrum monitor modules at introduction. Each module has power of arrival (POA) algorithms to monitor for interference and approximate the position where the interfering signal is being generated. 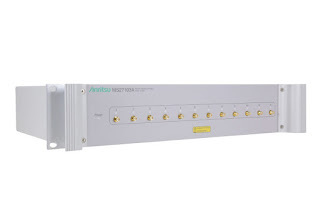 To address the rapid expansion of wireless communications, Anritsu has developed the MS27102A, which is designed to maximize network capacity by more efficiently solving issues associated with the presence of illegal or unlicensed signals that interfere with authorized transmissions. Certified with an IP67 rating, the MS27102A is the ideal solution for outdoor monitoring applications and can be wall- or pole-mounted. With an operating temperature range of –40⁰ C to +55⁰ C, one (or optionally two) weather-resistant RF In ports, a rugged weatherized case and splash proof design, the MS27102A performs in the most extreme weather conditions. The MS27103A helps operators provide quality services to consumers and meet KPIs for a maximum return on network investment. Designed for multiple antenna applications that cover wide frequency ranges, the MS27103A is a rack-mountable multi-port RF In probe that constantly monitors the spectrum to ensure optimal performance. Anritsu has developed this monitor for cellular operators requiring spectrum monitoring coverage for multiple sectors and numerous frequencies per sector at their BTS locations. Covering 9 kHz to 6 GHz, the probes have sweep rates up to 24 GHz/s, allowing capture of many interferers, including periodic or transient transmissions as well as short “bursty” signals. The modules also have low power consumption of < 11 watts. The spectrum monitor probes are designed for robust field deployments, with capabilities for remote power cycling, automated system recovery protocols and secure firmware updates. A “Golden” firmware image is placed on each unit and can be used to return the probe to full operation in the rare case the firmware is corrupted. Anritsu has developed Vision™ Application Software to automate collecting measurement data, providing useful information about network heath and spectrum use. Vision Monitor automatically records spectrum data, maintains a searchable spectrum history database, enables alarm functions for unusual signal activity and provides tools for managing the spectrum monitoring system. Users can also write custom monitoring program applications using available SCPI commands. Each pair of IQ data output is time-stamped using high precision GPS signals, allowing the IQ data to be used for Time Distance of Arrival (TDOA) applications for geo-locating signal positions. IQ data time stamp resolution is less than 9 nSec for precise signal location calculations. An integrated web server is embedded into each spectrum monitor probe. Using either Chrome or FireFox, a user from anywhere in the world can log in to the spectrum monitor module and control any of its features using a PC/laptop, tablet or smartphone. Each module also features Gbit Ethernet for fast transfers of measurement data and control information. Remote Spectrum Monitor complements Anritsu’s MasterClaw Monitoring multi-technology solution and expands Anritsu’s network monitoring portfolio that helps operators protect their network investments, achieve higher operational efficiency and increase revenue. Trusted by leading carriers globally, MasterClaw provides 24/7/365 visibility of network, service, app and customer usage, along with unrivaled troubleshooting. 0 comments on "Anritsu Introduces Modular, Scalable Remote Spectrum Monitor Platform that Changes Face of Spectrum Surveillance"